America Isn’t Broke. Its Priorities Are. In his State of the Union address, the president reminded us that “deficit reduction is not an economic plan.” Will he be able to hold off the austerity-mongerers? If the great debate in America in the years after the great recession has been between austerity and growth, on Tuesday night President Obama shifted it back to where it must be—to jobs and growth—if our fragile recovery is to be sustained. With 20 million Americans in need of full-time work, the president was right to issue the Kennedy-esque call, “It is our generation’s task…to reignite the true engine of America’s economic growth—a rising, thriving middle class.” But, left unanswered was how this White House or Congress plans to create jobs at the scale demanded? With single women, minorities and the young faring the worst, with wages sinking and with the top 1 percent capturing fully 93 percent of the nation’s income growth coming out of the Great Recession in 2010, how do we reset our course and compass and find “the North Star” the president spoke of? There was talk of a twenty-first-century WPA—a “Fix-it-First” program to put people to work on urgent repairs, like the 70,000 structurally deficient bridges across America and the floating of a long-discussed idea of a private-public Development Bank. But while Obama was clear that “deficit reduction is not an economic plan,” he also showed an unwillingness to boldly ignore deficit hawks (see Simpson-Bowles). But what captures our attention and imagination on the morning after are the president’s humane initiatives, the ones millions have organized for. There was Obama’s rousing call to raise the minimum wage and indexing it to rise automatically each year with the cost of living: “Tonight, let’s declare that In the wealthiest nation on Earth, no one who works full time should have to live in poverty.” (He mentioned the poor and poverty seven times.) His call for universal pre-school and pre-K and cost controls on higher education. His urging that Congress pass the Paycheck Fairness Act. His singling out of the overdue renewal of a strengthened Violence Against Women Act. His honoring of the 102-year-old Desilene Victor who waited six hours to vote last November, and with it a vow and a plan to fix our flawed voting systems. His determined, spirited, though oddly vague words about immigration reform. And while the president spoke of winding down wars—he announced that 34,000 troops will be home from Afghanistan by this time next year, ahead of schedule (but still too slow)—the glossy veneer of words applied to the lethality of an escalating drone war on a widening global battefield was hard to stomach. The president still clings to a failed free trade policy, to an “all of the above” energy policy even as he embraces alternatives, and his foreign policy “vision” is still heavily trained on fighting terrorism (even the ballyhooed cyber-security program). Tomorrow, Washington goes back to work. It confronts a manufactured crisis in the looming sequester and debt ceiling fight. What must be remembered the morning after is that America isn’t broke. It’s the priorities that are broken. And what’s too often missing from our media coverage is what matters—a recognition that the inside-the-Beltway crowd has a misplaced obsession with short-term deficits and debt rather than the real crisis of our time: joblessness, growing inequality and building a more sustainable, Main Street economy. In his odd, water-lunge response to the SOTU, Senator Marco Rubio failed to rebrand, renew or reinvigorate his party. Instead, he sounded like he might have been giving the speech from the lobby of Havana’s Tropicana hotel, circa 1958. Offering the same stale platitudes—is giving the SOTU response a certain death wish for presidential contenders?—Rubio talked the talk of small business but planted himself firmly on the side of the wealthiest, the corporations and polluters who refuse to pay their fair share. He also revealed himself to be the champion of cruel and senseless cuts that will only undermine an already beleaguered middle class—and cast even more into poverty. What’s needed now is bold citizen mobilization to make real the humane proposals launched at the State of the Union, while challenging the limits of the current economic debate. Toward the end of his remarks, President Obama spoke to the ideal of self-government: ‘…we were never sent here to be perfect. We were sent here to make what difference we can, to secure this nation, expand opportunity, and uphold our ideals through the hard, often frustrating, but absolutely necessary work of self-government.” It is time to make a difference, reclaim self-government and challenge the cruelty of austerity and its correlary—extreme and corrosive economic inequality. 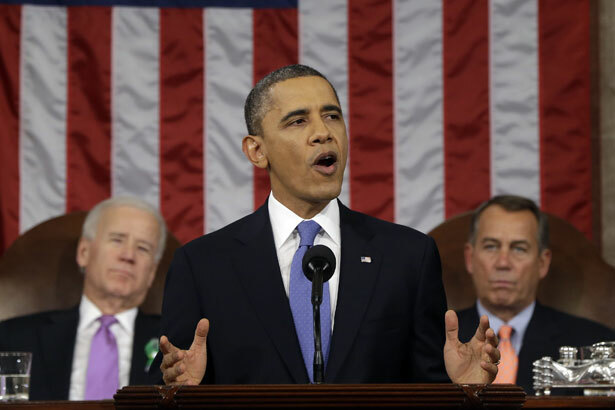 Even as Obama hit home on gun control, immigration reform languished, Aura Bogado writes.